Here's a couple of new releases of two 39 year old British space films!!! Hard to believe!!! 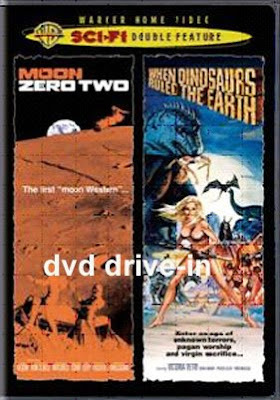 The first is MOON ZERO TWO, a Hammer film from 1969(it's double billed with WHEN DINOSAURS RULED THE EARTH as Best Buy exclusive!) that's a total hoot from the wild animated/swingin rock credits that are completely out of place but somehow, appropriate. The film stars James Olsen, Catherine Schell(yep, Maya from SPACE:1999 season 2) and Carol Cleveland(Monty Python) in a small role. Touted as a "space western" it has some fairly cool visual effects(with the clarity of DVD you can now see the folds in the black space backdrop cloth!!) and actually, good acting. The sets, clothing, costumes are everything 1960's but in the year 2021. Nice to know those fashions may have a comeback!! 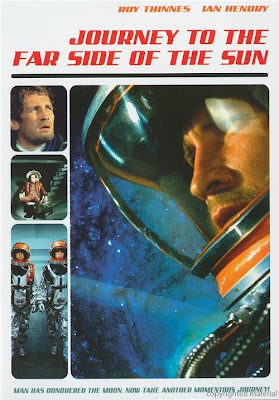 And speaking of SPACE:1999, a few years before Gerry Anderson made that series, he produced a cool, slightly illogical film called JOURNEY TO THE FAR SIDE OF THE SUN. Known in the UK as DOPPELGANGER, it tells the story of a journey, in the year 2069 to a new planet on the other side of the sun from the earth. When the two man crew-headed by Roy Thinnes-arrives they find something they didn't expect-that they've somehow returned to earth. Or have they? The film benefits from incredible FX work by Derek Meddings, and, a great score by Barry Gray who literally was the "sound" of anything Gerry Anderson. The film also stars most of the cast of the series UFO which was a spin off, more or less, of this film, in 1970. Again, it's nice to know that Nehru jackets and go-go boots will be in fashion again in 2069. Oddly, the series SPACE:1999 owes more to MOON ZERO TWO than JOURNEY despite the former film was a totally different production crew. I watch these old films, they're always a hoot to have on when I am painting something spacey. Both are available now, with MOON ZERO TWO being a Best Buy exclusive! 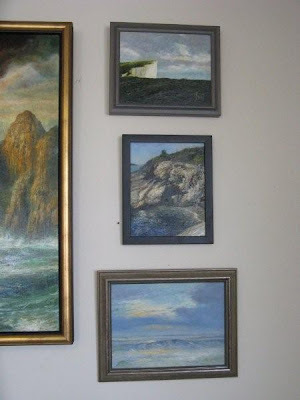 Here's the temporary home of the large painting that was returned to me. It's at The Art Corner in Salem Mass, in THEIR temporary home around the corner. Wendy is up and running well, again, and it's something to be happy for. 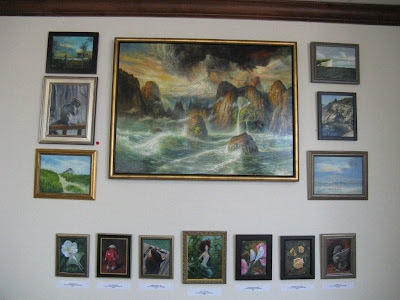 Also, subordinate to the large painting, are several of my small paintings, and, along the bottom, some of Marianne's. All are for sale at varying prices, but the large one is quite a price, comtemplate accordingly on that one!!! We literally had no room or wallspace, so it might as well be up on display! Something visual. I'd realized I was getting pretty boring with all those non-visual posts. Ah, well, here's something I've been working on. It's only been NINE YEARS since I came up with the idea for it and sketched it in, over seven years ago, only to have the canvas gather dust. It's called THE RAINBOW DRAGON and it'll be a major sized work, about 30x40 inches and in oils. These photos were taken by John A. Davis, over the weekend with his supercool camera. The painting is starting to look where it needs to be. These things always have a "crisis point" and I think I reached that and passed it. I also decided to put a small woman in the picture but, off to the right and not the "center" of attention. Hopefully the painting will be my showpiece for Illuxcon down in PA this Fall. I'll post some better, closer photos soon! This past weekend, we had John Davis and his wife, Kim up to visit. I feel like we've spent the last YEAR with them we'ev had visits of such regularity!!! John and I spent two and a half days brainstorming for a project(more info soon!) that we're creating together. It's terrific fun working with this guy-he's become a good friend and is an amazing writer to boot. The weekend was spent showing them around Rhode Island. We went to the Newport Cliffwalk which in all my years of living here, even I have not been on!!! So it was a first. And we had good food and conversation, as we always do. They're first class friends. When showing anyone around our state we always feel we're finding something new out ourselves. The other bit of cool news is that I am about to ink a contract to write a NEW book. 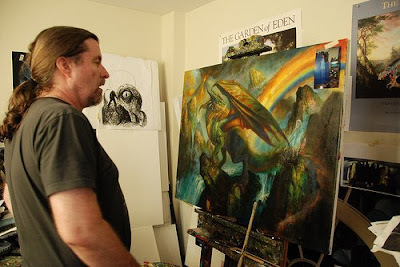 This'll be an instructional book-BOB EGGLETON'S ULTIMATE DRAGON PAINTING BOOK is the working title. It's going to be alot of work, but, as we'll see it'll look terrific when it's done. I didn't want to say too much about it or who it's with, but that's what I can tell you now. Everyone has asked me how I make dragons and so on, well, this will be the "book" on how I do it. Saw THE DARK KNIGHT and MAMMA MIA! and I can recommend both films!!! I'm a ABBA fan from 30 years ago so I was sold on MAMMA MIA! some time ago anyway! I'm busy with alot of stuff. Some cool news to announce next week when the ink is dry, and me doing a demo at the local Barnes and Noble books on Thursday, July 24th 7pm in Warwick, RI. Sorry things are so sporadic. 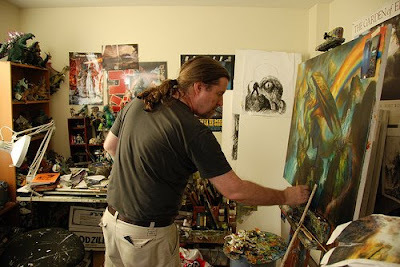 I am also working on a BIG painting, for me, that I have only taken close to 9 years to slowly put together. Then I saw this. It's pretty amazing- "Where in The World is Matt Dancing?" Nothing new to report much on. It's swealtering hot, very tired. Ear infection cleared up nicely but now my wife is having some medical hiccups but nothing serious, just one of those "things". Some visuals soon. I really had to slow up a bit. I saw WALL-E and it has to be perhaps my favorite animated film of this kind. One of the BEST sci-fi messages on alot of levels. It sums up that, we should not be so dependent on "technology" because in the end, it makes us lazy. And that, while space travel for long periods, is a nice Star Trek fantasy, it perhaps is just that-the reality is we'll just become fat, boneless blobs waited on hand and foot by technology that in the end, is the master. Humans were made for earth either by a series of accidents or, a Creator who as a cosmic intelligence, set things in motion(I tend to believe the latter) like evolution. The statement it makes is that earth is a pretty good planet and we'd better take care of it and not destroy it with pollution, global warming and so on, and then abandon it(as is the situation we find poor Wall-e in charge of) with trash, from this big-boxmart corporate throwaway culture. The end credits are worth the whole film alone. I won't say what they are based around. But it made me misty-eyed. Really. Beyond that, I'm resting abit watching some DVD movies, staying cool. And exercising(if there is one thing WALL-E did is that it made me do some extra laps on the treadmill) because nothing really pressing is due at present.